This easy version of a traditional fish pie makes an excellent family supper dish. 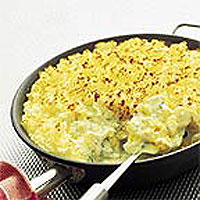 Look out for our range of frozen fish, and always keep some in the freezer so you can make this fish pie at any time. You could use all smoked or all plain fish if preferred. Cook the potatoes in boiling water for 15-20 minutes until tender. While the potatoes are cooking, heat the butter, olive oil and garlic in a large, non-stick frying pan until the butter begins to foam. Over a high heat, fry the fish pieces in batches for 1-2 minutes on each side. Remove the pieces when cooked and keep warm on a plate. Return the fish to the pan when it is all cooked. Spoon the mustard, crème fraîche and parsley over the fish, allowing the mixture to melt into the fish without stirring - it will look quite liquid at this stage. Preheat the grill to high. Drain the cooked potatoes thoroughly. Add 4 tbsp of the creamy fish liquid and mash until smooth and creamy. Spoon the mashed potato roughly over the fish. It does not matter if some of the mash drops to the bottom of the pan, rather than sitting on top. Place the pan under the hot grill for 3-5 minutes until the potato is golden. Serve immediately with broccoli, peas or spinach. The cooked fish can be spooned over hot baked potatoes or eaten with nutty brown rice.